The eagerly awaited Shri Amarnath Yatra 2019 is all set to start from 28th June 2018, on the auspicious day of Jyestha Purnima, as per Hindu Calendar and as per continuing tradition, would conclude on Shravan Purnima (Raksha Bandhan) on 26th August, 2019. Registration for the 60-day holy Amarnath Yatra will start on the 1st March 2019. Here is all the information you need on how to register for Amarnath Yatra 2018. We help you have an easy and comfortable registration process. Registration and issue of Yatra Permit will be available at 440 branches of the Punjab National Bank, the Jammu and Kashmir Bank and the YES Bank across the country, on first-come-first-serve basis. Amarnath Yatra Permit is valid for only 1 Yatri (pilgrim/traveler). Every Registration Branch has been given a specified per day/ per route quota for registration of Amarnath yatris. The Branch has to make sure that the number of yatris registered does not goes beyond the allotted per day/ per route quota. A lady who is more than 6 weeks pregnant, and a person who is below 13 years of age or above 75 years will not be registered for Amarnath Yatra 2018. 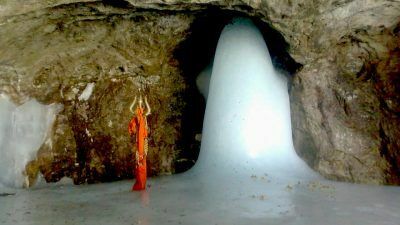 For getting an Amarnath Yatra permit, one is required to submit Application Form and Compulsory Health Certificate (CHC). The formats for both these are available online by Shri Amarnath Shrine Board (SASB). Also, the CHC that one submits, must be availed from the names that are mentioned in the List of Authorized Institutions / Doctors by SASB online. CHC and the Application Form are available free of cost to the applicants at the Registration Branch. Prescribed Compulsory Health Certificate (CHC) issued on/after 10th Feb 2018 by the Authorized Doctor/ Medical Institution without which you cannot complete the process for Amarnath Yatra Registration. 4 passport size photographs are required for the yatra permit and 1 is for the application form. Whether the application form is filled correctly and signed duly by the applicant. The day on which the Yatri will be embarking on the Yatra is printed on the permit. That is going to be the day when the Yatri will be allowed to cross the Access Control Gates at Baltal and Chandanwari in Pahalgam. Before issuing the permit for crossing the Gates, the Bank Branch must make sure that the date for which the permit has been issued must match the day that is printed on it. The year and the date of Yatra is pre-printed on the Yatra Permit Forms. Thus, it is compulsory for the designated Bank Branch that they must write or stamp the date and the year of Yatra, then pasting it with a transparent tape so that the writing is free of any tampering. The shrine board authorities have to ensure that all this is done only when the Yatra permit is issued and not in advance. If all the papers are in order, the Registration Officer allots the permit after the applicant makes the payment of INR 50 per Yatra permit. Out this amount, INR 35 goes to the Shri Amarnath Shrine Board and the rest is kept by the Bank. The officer will stick the passport size photographs and fill the Yatra Permit Form right on the spot according to the details mentioned that the Yatri has filled in the Application Form and the CHC. The date of the Yatra must also be correct. The Yatra permit is signed by the Officer who then applies the Bank Branch Seal on the permit in such a way that it is partly on the applicant’s photograph and is partly on the permit. The stamping or writing of the date, year etc. of Yatra must be done on the spot. No stamping and application of the seal must be done in advance. Serial number of the Yatra Permit. Date of issue of the Yatra Permit. Name, address and contact details of the Yatri. Name of immediate family member of the applicant who can be contacted if any emergency arises. Route of the Amarnath Yatra. Date of commencement of the Yatra from Baltal/ Pahalgam. Every details related to the process of issuing the Yatra permits along with the particulars of the applicants are e-mailed by the Registering Bank to the SASB (email-id: sasbjk2001@gmail.com) on a daily basis. It is mandatory for the Nodal Bank Branch or the Nodal Officer to inform the board about the total Yatra Permits issued in the day, in proper order of date-wise and route-wise, on a daily basis, by 08:00 PM. Without fail, the board needs to receive these details on its e-mail id. After the completion of the process of registration, all the Applicant Forms and CHCs along with the number of Yatra Permits issued, are forwarded to the CEO, Shri Amarnath Shrine Board. After the completion of the registration process, the Yatra Permit Forms that were not used are given back by the branches to the Nodal Officer by Registered Post. He then, by hand, returns these unused forms to the CEO, SASB. The registration of the yatris can be done by the Registering Branch after the usual banking hours. The registration process is a tiring procedure. Pilgrims can avoid the hassle of lengthy queues and long procedures as Yatra by Helicopter solves the hassle of registration. You do not need to fill forms and walk on foot. The swift and hassle free trip by Helicopter takes you to the ‘Abode of Lord Shiva’ and back. Time and energy will be saved in registration as well as the Yatra. It is very easy to get helicopter services. Only carry the requisite health checkups certificates and you are fit to make your divine Yatra.